The best way to test a battery is under load, and it is even better to test it under a full load. This is a battery load tester capable of up to 800 amps load, but is adjustable so that each battery can be tested at its appropriate load. The best load for testing is typically half the cold cranking amp rating, or 3 times the amp hour rating. 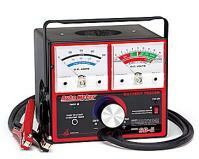 This unit also has capability for testing the starter current draw as well as the alternator function.. Applications 6V & 12V Automotive & Commercial Starting Batteries. 12V Starting and Charging Systems.